A simple, quick and delicious pasta that is suited for lunch, dinner or even as an evening snack. 1. Cook the pasta as per packet instructions and drain. 3. Heat oil in a nonstick pan over medium flame. 4. Add the tomatoes and cook for 5 minutes. 5. Add the garlic and stir well. 7. Add some coriander leaves, stir well and cook for 10 minutes or until the tomatoes are well cooked and mashed. 8. If the mixture becomes too dry, add a little water but do not add too much. 9. Add the cooked pasta and stir gently until evenly mixed. 10. Garnish with cheese and basil leaves. 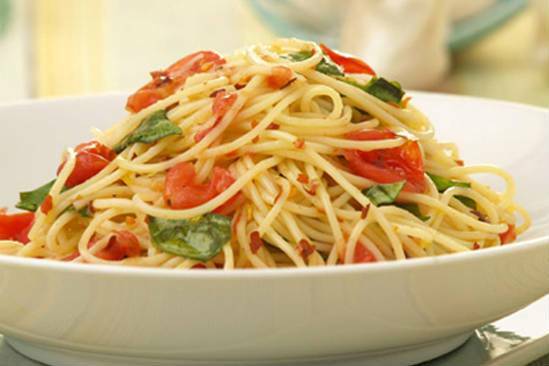 Feel free to comment or share your thoughts on this Tomato Garlic Pasta Recipe from Awesome Cuisine.